Tonight I was only slightly prepared. I had chicken breasts in the refrigerator waiting to be cooked. I came home from work tired, but with good intentions. I sat and chatted a while with Tony, and then we discussed dinner. He was very hungry, but agreeable to eating whatever we had on hand. I offered to boil chicken breasts, and you could tell he was less than excited. Still, he kept saying in a very sad voice that he would just eat whatever I was having. I ended up feeling bad for him and suggested we walk to the Valley Inn. I knew I could find something acceptable on the menu for me. I ordered the gazpacho soup which I have never eaten there. It was fresh, tasty, and the vegetables were crisp and delicious. I also ordered a shrimp appetizer as my entree. I ate differently than usual there, but enjoyed it as much as always! I am delighted with my dinner tonight. I've stayed within my calorie allotment for the day, and I thankfully didn't have another salad for dinner. As much as I enjoy my salads, I need a little more variety during the week. I weighed my steak on a scale, and measured out 4 ounces. I ate a half of a yam and a couple of cups of boiled tender endives. It doesn't look like a lot of food, but I ate slowly and I was totally satisfied by the time I was done. I drank tons of water while I ate which probably helped to make me feel full. I made a relatively boring, routine dinner for my Monday night meal. I'm not putting much effort into my meal planning. I stopped off at Whole Foods on my way home from work, bought Arugula lettuce that was already triple washed, and a piece of chicken that was already cooked. I came home and made it into a salad. The laziness I brought to the table, made me feel like I didn't deserve to weigh less today. I have the day off, so I plan to grocery shop, buy more vegetables, and see if I can come up with a dinner that is dietetic, but more creative than my dull plain salad. Patti's plate needs to become more palatable! Today I had a special treat. I went to a brunch at the most beautiful restaurant perched high among the buildings of downtown, Los Angeles, Perch. I definitely felt like I was on vacation in another country. There is a beautiful inside/outside feel to the restaurant. Music from a live band is playing, and there is an eclectic clientele throughout, and everyone seems to be enjoying themselves. I was eyeing the delicious looking hamburgers served at the table next to me. I was so happy with myself that I was able to refrain from ordering one. Tony and I shared a beautiful fruit plate with Greek yogurt, croissants, and pastries, and an order of truffle fries. I mainly ate the fruit, which left Tony very happy to finish the rest. I must admit, in all honesty, I did taste everything. Superb! And worth a little Sunday indulgence. Back to the grind, tomorrow! Saturday night is my "cheat" night. I still avoid Mexican food or pizza. But, I do allow myself dinner out with my husband. He is so good about fending for himself all week, it's a night we both can look forward to. Before we went to the restaurant, I looked at the menu online to see what my best choice would be. I was debating between having an appetizer of ahi tuna as my entree or having calf's liver which I've never ordered in my life. The closest thing to my eating liver in a restaurant was when I was a child and took a huge scoop of chopped liver off of a Vegas buffet thinking it was chocolate ice cream. (True story) Anyhow, prior to going out, I entered the liver in to my daily log (My Fitness Pal) along with spinach, a green salad, and a gin martini. ( I repeat, Saturday night) I was still under calories for the day, so I thought I was doing well. Here's where I made the mistake: I didn't say "no sauce." At least I didn't eat the mashed potatoes. From the looks of the photo, I think I should have gone with the Ahi! As my mother would say, "I livered it up today!" Today I had a short conversation about diets with a friend of mine who is an interior designer. She is thin, fit, and very pretty. She told me something many others have told me before. "Don't think of it as diet, think of it as a lifestyle change." Unfortunately, I need to consider it a strict diet with immediate results for me to have the willpower to complete each day. I have tried the "lifestyle change" many times. Eventually, I let life get in the way, I get lazy, and I go back to my bad habits. Through the years of dieting, I have made some major changes. Every time I try something new, I learn a little more. I definitely eat differently than I did when I was younger. I haven't had a soda, diet or regular in years. I also don't remember the last time that I had a taste of ice cream! (Root beer floats used to be my favorite as a teen). So, although I have picked up some lifestyle changes, I still need a rigid diet to follow to lose weight. Tonight I came home from work, tired, hungry and unprepared. I looked in the refrigerator and didn't see much. Tony had leftover spaghetti that he could eat, but I didn't even have lettuce to make a salad. Then, my eyes caught a small cabbage in the crisper drawer. The good thing about cabbage is that it lasts longer than other vegetables. I peeled off the out layer and was happy to find an alternative to my usual salad. I shredded it and added sweet onion and avocado. I also defrosted a piece of Jim's fish from last week and broiled it. If I wasn't on a strict diet, I could have made the excuse to give up and order pizza. I am happy to say I persevered! I have been so good about eating at home during the week for dinner. I take care of myself; my husband takes care of himself. I may not sound like a good Greek wife, but I am doing what I need to do to get thinner. He will be happy in the long run. Yesterday, on a Thursday night, he asked me to go to dinner with him and a friend because his friend's wife is out of town. I would have been fine to be left at home while he goes out, but for some reason he likes me to accompany him. So, the three of us went to dinner at the Valley Inn and I searched the menu for my best option. I settled on the Shrimp special, because shrimp has very few calories. It was served on a bed of couscous and mango salsa which may have been flavored with lots of fatty calories because it was quite delicious. Although I seldom drink these days, I also had a glass of red wine. I know I went off track of my super strict regime. Still, I made better choices that three weeks ago I never would have made. And the topper is I still got up this morning bright and early to exercise! Wow. I just finished a delightful meal. From the looks of Patti's Plate, one would think that I am eating yet another boring protein and salad dinner. But you have no idea how good my food is tonight. I took that delicious fresh fish that I received from my neighbor the other day, and broiled it in the oven with sea salt, pepper, lemon and a drop of olive oil. I put it on broil for only 4 minutes and it was transformed into white, flaky, moist fish. I am not one who normally loves fish, but this was really good. There was not a hint of that fishy smell that often permeates the house when cooking fish. Another day of dieting completed! I'm going to bed early. I'm looking forward to waking up feeling thinner. I always get great diet food ideas when I go to the hair salon. The stylists are quite fit, and seem to know the tricks of the trade for staying slim. Tonight's recipe is thanks to Todd. He gave me the recipe for a delicious tomatillos sauce that can be kept in the refrigerator, and used to accompany any type of meat. He suggested a lean pork tenderloin to go with it. I made it tonight and have to say that it's out of this world. After cutting and roasting the tomatillos, I put everything in the food processor. Process to desired consistency and it makes a great sauce. I spooned just a little over the pork, and added a salad. It didn't feel like a diet night. My husband was happy because he got to eat it as a dip with chips! I'm not sure which direction I should take tonight. Should I write about the food that was on Patti's plate today? Should I write about the exercise that I have been doing faithfully every morning for the last couple of weeks? Should I write about the weight loss I have actually thankfully experienced since I started writing again? I think I will skip all of that for another day. Today I am going to share with you a really exciting by product of my weight loss blog. I originally started writing as a way to focus on my diet and to help and share with others who are on a weight loss journey too. Not long after I started writing regularly, Google reached out to me and offered to put advertising on my site. It was fun to see my daily entry on the same page as a Weight Watchers ad. (Especially since I have spent so much money on Weight Watchers in my life.) But, what was really fun was what happened today. I have been a reader of financial guru, Leo Quinn, for several years. His latest newsletter mentioned making money by blogging. I wrote to him and told him how excited I was to learn more. And..... I sent him the link to Patti's Plate. The next thing I knew, he posted my link in his newsletter, and my readership multiplied overnight! Thank you, Leo. I will return the favor by posting a link to you. Tonight I got very lucky! Our good friend, and neighbor, Jim, just came back from a 5 day fishing trip 200 miles south of San Diego off the coast of Mexico. He brought back fresh sushi grade yellow tail in vacuum sealed bags. I opened a bag, sliced the fish very thin, and sprinkled it with sea salt and pickled jalapeños. I added a slice or two of avocado and......delicious!!!! I have to admit, I only ate this as an appetizer, but believe it or not it was quite filling. I also made a salad for dinner. I've had to do a little catch up with my posts. I've been pretty busy the last few days, but I did not let that detour me from my goal. I've watched my food intake, and I've been faithfully exercising every morning. (Except Sunday) I have really been striving for consistency. I find that keeping to a pretty strict schedule every day is really key to me losing weight. I make sure I go to the gym each morning, and I try to make good food choices every day, even when I am faced with an unexpected meal invitation. Today I went to lunch at a BBQ restaurant that didn't even have a salad on their menu. I ate a chicken breast (removed the skin) and collard greens. I was slightly tempted to order the pork sandwich with jalapeños, but I didn't! I have really been looking forward to my dinners since I stopped eating fish almost every night. I much prefer meat to fish. When I realized that lamb chops had almost the same amount of calories as Tilapia, it was a no brainer. I much prefer the lamb chops. I made a big green salad and broiled lamb chops and I was very satisfied. I would have added a sweet potato, but I am being really strict right now. I am so tired of being overweight! This was an unusually full weekend for me. Anyone who knows me well, knows I have become quite the hermit. I do not like going out much. But I was invited by my son who lives in Redondo Beach to go to a Greek Festival. Since it was an opportunity for me to visit with my son, I went! We took my Mom for a ride and had a nice scenic view of the ocean. We ended up dining at Petros in Manhattan Beach. I love this Greek restaurant. We ordered a few appetizers for the table, but I only ate the salad and the beets and octopus. Opa! I went out for lunch again today! I was asked as a favor to go to a luncheon health conference by a pharmaceutical representative who I have known for a while. It took place at a steakhouse in downtown Los Angeles. I won't say the restaurant's name because the picture really does not do it justice. The food did not taste as bad as it looks. The first thing that was passed on the table was a big basket of hot bread. (My weakness) I didn't touch it. They served a small ceasar salad with fresh croutons, and I slid all of mine to the side of my plate and didn't touch them either. I had a choice of breaded fish, chicken Parmesan , or beef with a cherry sauce. I ordered the beef without the sauce. I was doing so well, I most certainly was not going to give in to temptation with dessert. They served one of my favorites, Creme brûlée. I immediately gave it to the nice lady sitting next to me. She was so appreciative, and I was proud of myself! Ps. I did not touch the mashed potatoes either ! Today was a really great day. I have the best job ever. I got to work and was invited by my boss to go to the Design Center with her. We picked up her brother in law who was my boss over 30 years ago, and together went looking for furniture at different showrooms. Then, we went to lunch at Wolfgang Pucks restaurant, Red Seven. Rather than join the others and order an entree, I ordered an appetizer of chicken lettuce wraps. It was a perfect choice. Patti's plate must have been very happy today! It was covered with delicious healthy food that Patti loved. I changed it up a bit tonight. Instead of fish, I splurged on a tender filet mignon. It took less than 5 minutes to broil. I seasoned it with a dash of kosher salt, freshly ground pepper, and a hint of balsamic vinegar. It was so good, I tried to eat it as slowly as possible to savor every bite. I made an arugula salad to go with it along with some leftover asparagus. I do not feel deprived at all. I also have 4 ounces left over to take to work with me tomorrow. I will have 2 ounces at 11 am and 2 ounces at 2 pm. I am trying to eat little meals throughout the day to keep my metabolism going. On another note, I have been faithful to my commitment of going to the gym every morning! Winning! Another successful day under my shrinking belt, (I really don't even own a belt, but it sounded good). My eating was pretty boring throughout the day. I ate more or less the same things I have been eating the past couple of days. (protein pancake, fish for lunch, yogurt and fruit snack, couple of almonds with a glass of kombucha, and lots of water). Last night's dinner I tried to make it a little more appetizing. I splurged and bought sea bass instead of Tilapia or frozen Orange Roughy like I had the night before. I also made spinach instead of asparagus. I added a salad with heirloom tomatoes and felt like I was treating myself to a pretty meal. My husband has been very helpful. He has been making his own dinners. (spaghetti or sandwiches) It's much easier to concentrate only on myself. When I stop making the strict fish dinners, he will probably join me. But for now, it's all about me. Today went much better than yesterday! I still probably didn't eat enough, but I overate so much over the weekend, I just wanted to lose whatever weight I had added so I could get back to a normal, safe reducing diet. I think I am there. Today I added a 4 pm snack that really helped me continue on through the night. I cut up a peach and added a scoop of Greek yogurt drizzled with raw honey. It reminded me of my trip years ago to Corfu when I would eat that snack every afternoon. In those days I was active and thin without even trying. The sad thing is I didn't appreciate it enough at the time. My goal is to go back to Corfu in two years, (hi Kathy!) and be grateful for the fit body I plan to bring! I took one look at last night’s post and had to laugh. That is the worst looking dinner I have ever seen. I was desperately trying to get the day over. That is really not a good way to live. Today I don’t have to work, so I have more time to prepare. I do love the idea of Tilapia and asparagus for dinner. My friend, (shout out to Ailin, who just competed at the Muscle Beach body building competition) is great at giving me ideas for weight loss. She is the one who introduced me to the protein pancake. She also told me to eat several small meals of protein and vegetables throughout the day. 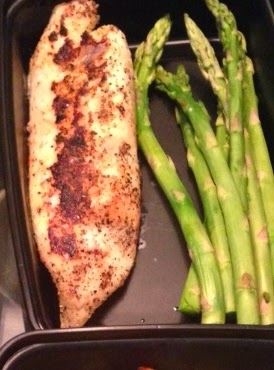 Tilapia and asparagus is her mainstay when competing. I need to practice cooking it so that it doesn’t look like it did in yesterday’s picture. I also need to start eating more throughout the day. It will help my metabolism and also give me more energy. Speaking of energy, I dragged my body out of bed this morning and went to the gym again! Today’s photo is what Ailin’s Tilapia meals look like. Notice how hers look straight, tall and thin, and mine looks short, fat and thrown together? I decided to go to bed very early tonight. If I stay up I'm afraid I'll get so hungry I will eat. I wish I could go to sleep for a week and wake up thin. As long as I'm wishing, I might as well wish I could wake up thin tomorrow. Oh well. At least I won't wake up heavier. Not after today! Actually, I didn't eat enough today. For breakfast I made my protein pancake, lunch was turkey and an apple and for dinner I made Tilapia and asparagus. I could have had more food, but I was too tired to make anything else. I just want to wake up and weigh less. I've gone to the gym regularly before. I have dieted consistently before. In the past few years, I have not combined the two. I have decided to take my weight loss seriously and am pledging, starting today, to do both. As I have said in the past, I can't lose weight without spending money. Over the weekend I purchased a Fitbit tracker. I am supposed to wear it at all times, even when I sleep or shower. It will track my activity and give me an incentive to stay on track. I already went to the gym this morning! Yesterday was a cheat day. Sometimes I feel like if I eat a lot, I'll rev up my metabolism and shock it into overdrive when I go back to lighter eating. Overall, I'll lose weight and still have my day of indulgence. It's sort of the "have my cake and eat it to too" philosophy. (What the heck does that even mean?) Anyhow, you get the idea. I overate. It started with breakfast, but it was totally worth it. I was treated to a delicious smoothie, homemade waffles, and a bacon, leek, and Gruyere quiche that was out of this world. It was well worth the calories! What better way to celebrate the 4th of July than expressing your own independent style of eating? Forget the hamburgers and hot dogs. Forget the beer! Celebrate the holiday with celery and fish and a big glass of water. I've been concentrating on healthy eating for about two weeks now. For several days my scale went down, and then, overnight, after one night of poor eating, I was right back where I started. Truth is I haven't really and truly committed. I've had a mental block for a while now. It takes a lot of work to really lose weight. I just have not put in the effort. This isn't the only aspect of my life that I'm lagging. I don't go to the gym like I used to, I seldom read, I don't keep up with my friends, and overall, I guess you might say I've been lazy. This attitude is obviously not good for me. So along with the revival of Patti's Plate, I am hoping to revitalize and nourish other parts of me and not just my body. If a lowly caterpillar can change, why can't I? Patti's power pancake, Patti's perfect pancake, you name it.....I can't say enough! A delicious healthy pancake ended up on Patti's plate this morning, and I am ecstatic! My friend is a body builder who is very tiny except when flexing her muscles. She is always giving me weight loss suggestions, but as anyone can see by taking a look at me, I seldom follow them. Well, this morning I did, and I couldn't be happier! This is so easy, so filling and so good. I ate it and feel ready to take on not only the day, but the entire week! Add to blender 1/2 of a banana, 3 egg whites, and 1/2 of a cup of instant organic oatmeal. Mix and pour batter onto a coconut oil sprayed non stick pan. Cook on both sides and you are done! You can add a light coating of natural peanut or almond butter on top. I'm serious. This is the best!